This phrase is all too familiar to parents with little ones that get into a flap when they can’t find their favourite doll, Princess Sparkle. It’s also the title of the gorgeous children’s book. 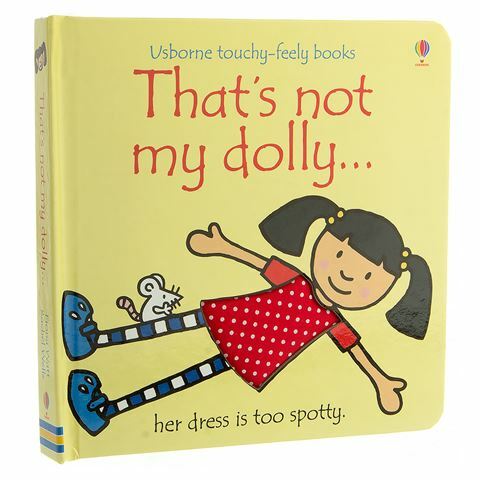 That’s Not My Dolly was written by British author Fiona Watts, and features beautiful and playful illustrations by Rachel Wells. The thick, cardboard pages are perfect for little hands, while the fabric swatches throughout the hardcover book will give your child the tactile experience of different textures, and the easy-to-read, bold text develops their language awareness. This delightful children’s book follows a mischievous mouse on her quest to find its beloved dolly. Your little one must join the mouse, as it feels the swatches to determine which of the five dolls belong to it. Keep little minds and hands busy, with That’s Not My Dolly. Written by Fiona Watt, with beautiful illustrations by Rachel Wells. Hardcover – 10 thick, cardboard pages. Includes fabric swatches throughout to give children the tactile experience of different textures. Helps to develop your child’s language awareness. Dimensions: 16.5cm (w) x 16.5cm (h) x 1.5cm (d). Book - Richard Scarry's Best Little Golden Books Ever!